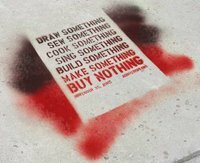 Jack Kuenzie of WISTV writes: Buy Nothing Day began more than a decade ago, and was the work of Adbusters , an anti- consumerism group. The organization wants shoppers on the Friday after Thanksgiving to step back and make a small choice not to shop..."It's symbolic. It's meant to focus Americans more on what we should be focused on...We always talk a good game about values, but we don't put them into practice." 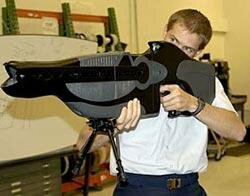 Will Knight of NewScientist.com writes: The US government has unveiled a "non-lethal" laser rifle designed to dazzle enemy personnel without causing them permanent harm...the Personnel Halting and Stimulation Response (PHASR) rifle was developed at the Air Force Research Laboratory in New Mexico, US, and two prototypes have been delivered to military bases in Texas and Virginia for further testing.